The Centre for Neural Engineering at the University of Melbourne is an integrated centre for collaborative research co-locating computational and electrical engineering with biological sciences, primarily neuroscience. It blurs boundaries between laboratory, workshop, specialist and office spaces. A unique interface between medicine and engineering including five different types of research. The Centre for Neural Engineering is an integrated centre for research that co-locates computational and electrical engineering with the biological sciences, primarily neuroscience. Paul Morgan Architects designed the building as a ‘showroom’ for displaying the centre’s activities. The architecture deliberately blurs the boundaries between laboratory, workshop, specialist and office spaces to create a collaborative research environment. The CfNE project has been conceived as a space where this new knowledge combination of the physical and life sciences can collaborate, through research, presentation and discussion in both formal and informal spaces. Spaces include a new multi-use PC2 laboratory, psychophysics booths, an electronic workshop, collaborative meeting spaces and conference facilities. Upon entry a bluestone pedestal supports the new co-located field of knowledge, like a new urban institution. The elongated entry steps enhance the experience of traversing obliquely up to the pedestal as is a common approach in such civic spaces (eg. State Library stairs). The approach draws attention to the ceiling which is a three-dimensional translation of the spike trains that are used in the computational analysis of neuronal code. The spike layout is defined by basic geometric rules forming an undulating ceiling field which supports services and assists in acoustic dispersion. Colours are also used incisively to emphasise the visceral spatial quality and highlight key research spaces. 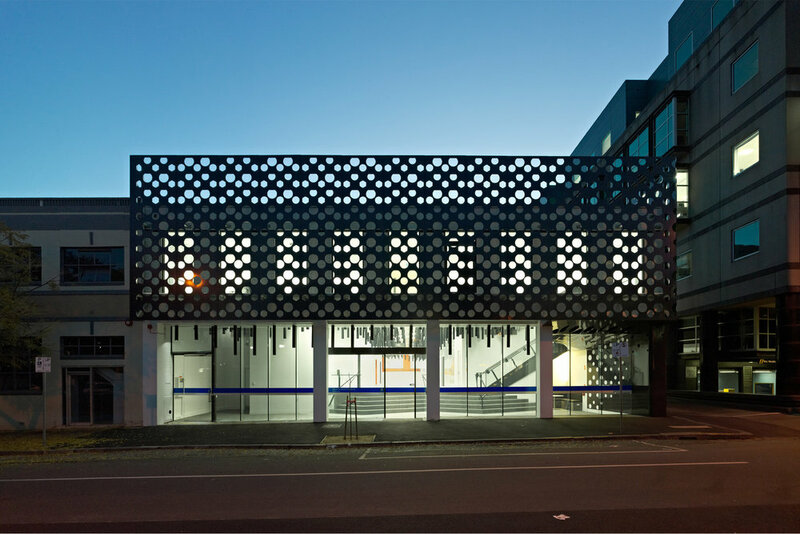 Perforations in the façade vary in density with most exposure at a seated eye level to permit framed views through the screen to Lincoln Square opposite.The black façade is wrapped down to the ground to provide an urban corner consistent with adjacent buildings and to emphasise the shop-front nature of the facility.